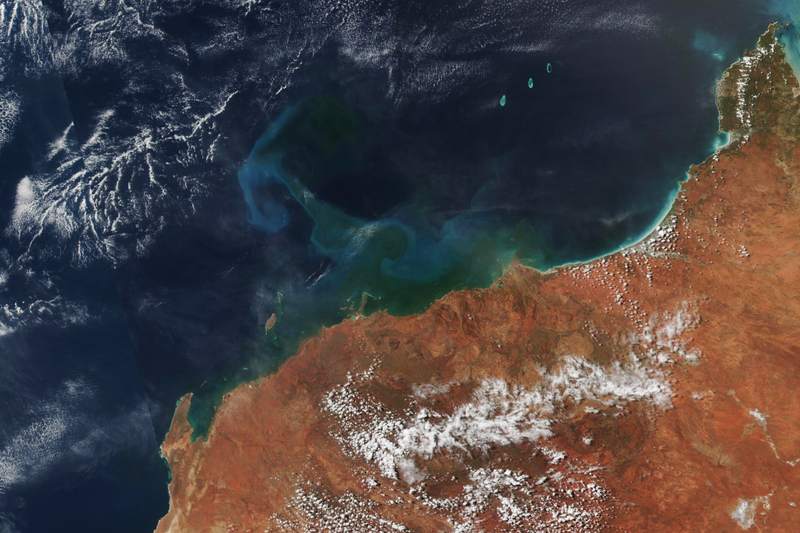 In late March 2019, tropical cyclone Veronica made landfall along the Pilbara coast in Western Australia. Dropping more than 46 centimeters (18 inches) of rain in some areas within 72 hours, the storm caused major flooding and spurred several home evacuations. The destructive winds and the rainfall runoff also stirred up offshore waters, with lingering effects. 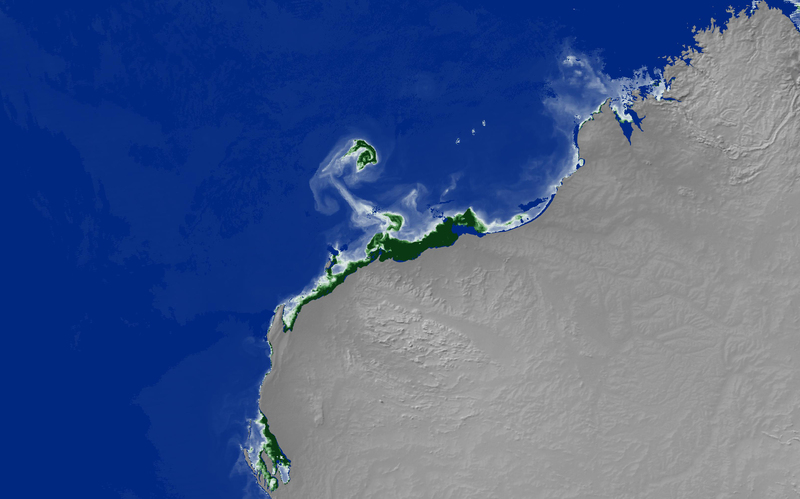 The image above shows discolored water offshore from Port Hedland on March 29, 2019, as observed by the Visible Infrared Imaging Radiometer Suite (VIIRS) instrument on Suomi NPP. 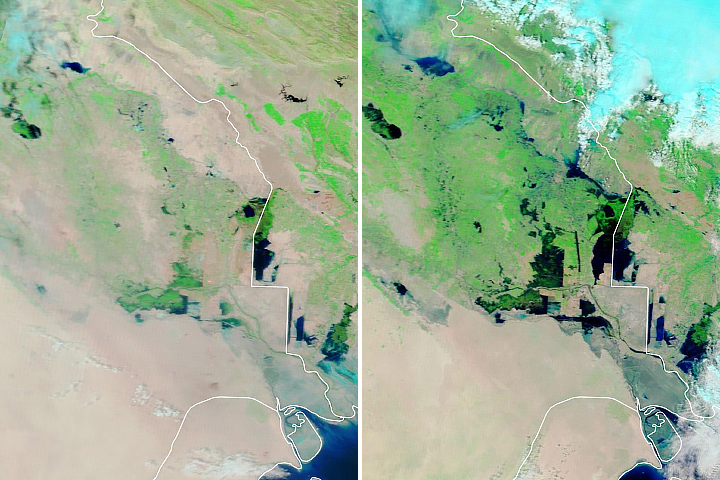 Satellite imagery shows what is likely a combination of suspended sediment and phytoplankton blooms appearing by March 27 and continuing through April 2, 2019. 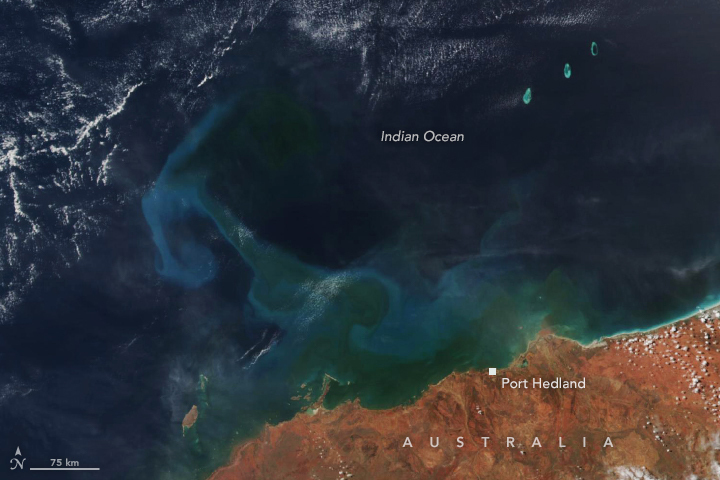 The Australian Bureau of Meteorology reported that a phytoplankton bloom was taking place at the time. 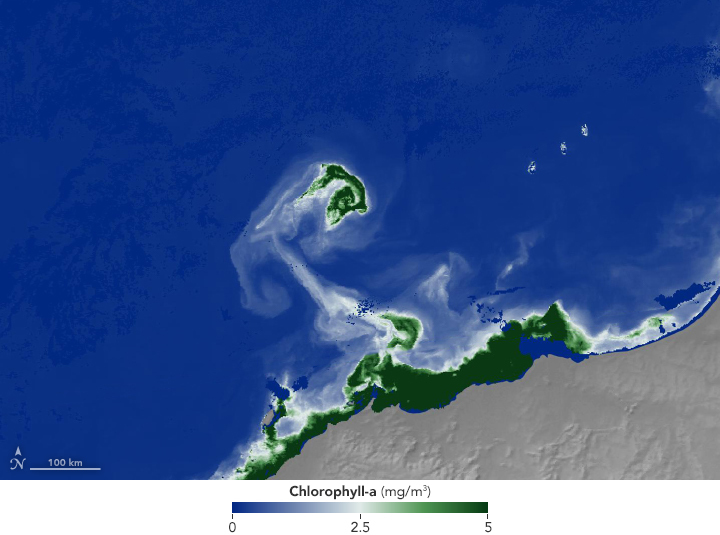 The image below shows concentrations of chlorophyll, the pigment that phytoplankton use to harvest sunlight, as derived by the Moderate Resolution Imaging Spectroradiometer (MODIS) on March 29, 2019. Past studies have shown that cyclonic winds can stir up ocean waters and bring nutrients to the surface, promoting blooms of phytoplankton. In coastal waters, nutrients often come from the resuspension of seafloor sediments and from river runoff. “Sometimes you can see a bloom last for many days over the open ocean after a tropical cyclone has passed,” said Sen Chiao, meteorologist at San Jose State University and director of the NASA-funded Center for Applied Atmospheric Research and Education. Chiao added that Veronica seems to have pulled cooler water up from the ocean depths to the surface (upwelling), which provided more nutrients. A similar bloom also followed a tropical cyclone a few years ago in the same region of Western Australia. NASA Earth Observatory images by Lauren Dauphin, using VIIRS data from the Suomi National Polar-orbiting Partnership and MODIS data from NASA EOSDIS/LANCE and GIBS/Worldview. Story by Kasha Patel. Australian Government Bureau of Meteorology Severe Tropical Cyclone Veronica. Accessed April 2, 2019. McKinnonm A.D., et al. (2003, January) Rapid changes in shelf waters and pelagic communities on the southern Northwest Shelf, Australia, following a tropical cyclone. Continental Shelf Research , 23 (1), 93-111. 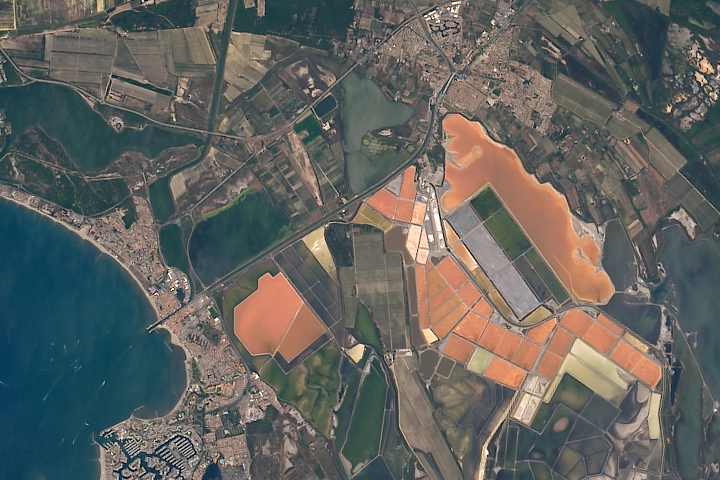 Accessed April 2, 2019.
news24 (2013, March 6) Cyclone causes algae blooms in Australia. Accessed April 2, 2019.